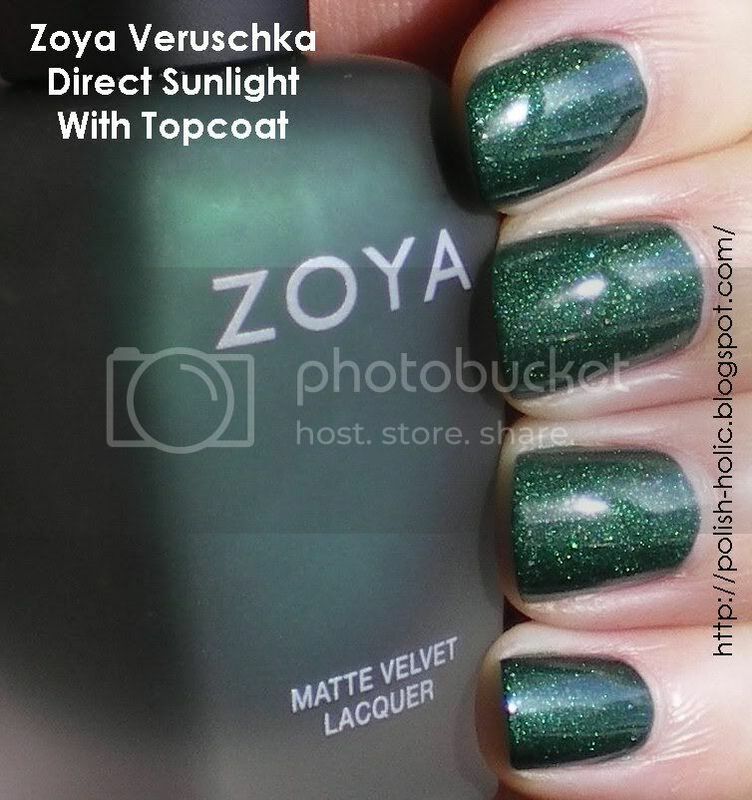 Veruschka is a forest green matte packed with silver shimmer. So it's completely blingy without being shiny. I really love this, but I think I'm sick of the matte look. 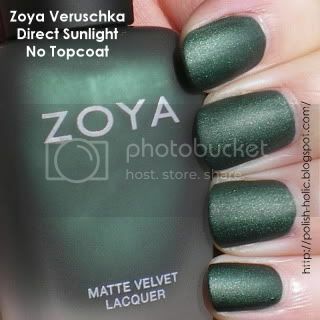 I almost always slap a topcoat onto whatever matte polish I'm wearing. So I've got both looks here. This is two coats. It's slightly thick and goopy, but nothing you can't work with, just be more careful. Adding topcoat just makes it that much more blingy. I just got this yesterday - isn't it funny how we are all putting top coats on our mattes and matting our jellies and flakies?!?! I like it a lot with topcoat. 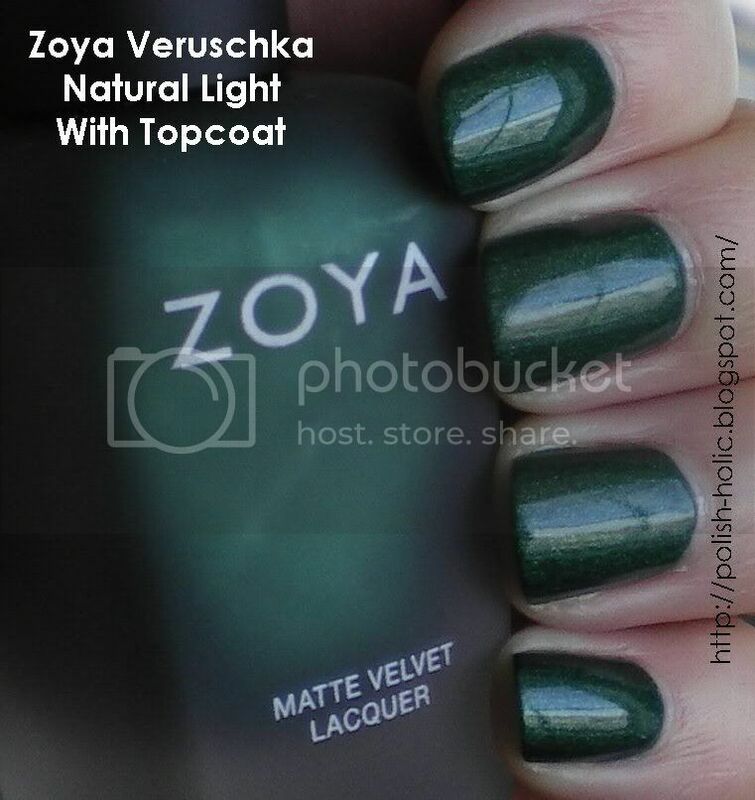 I have this one from the Zoya Green Friday thing but I haven't tried it out yet. Great pictures! That is a beautiful green! l0verlada: Oh it so is! Colette: Hahaha. I look forward to that post! Katie: Thanks. And this is the only matte Zoya I've tried. I find all the mattes to be similar though. Stephanie: Thanks, and my Veruschka is also from the Green Friday sale. It always takes me a while to get around to untrieds. I was actually astounded how good this looked. The bottle is frosted so you can't really see it. It's amazing.